Donald Trump & Eric Trump Used Kids-Cancer Charity Money In Their Business: LIKE AUTUMN LEAVES, sponsored Cadillacs, Ferraris and Maseratis descend on the Trump National Golf Club in Westchester County, New York, in September for the Eric Trump Foundation golf invitational. Year after year, the formula is consistent: 18 holes of perfectly trimmed fairways with a dose of Trumpian tackiness, including Hooters waitresses and cigar spreads, followed by a clubhouse dinner, dates encouraged. The crowd leans toward real estate insiders, family friends and C-list celebrities, such as former baseball slugger Darryl Strawberry and reality housewife (and bankruptcy-fraud felon) Teresa Giudice. The best part about all this, according to EricTrump, is the charity’s efficiency: Because he can get his family’s golf course for free and have most of the other costs donated, virtually all the money contributed will go toward helping kids with cancer. “We get to use our assets 100% free of charge,” Trump tells Forbes. EricTrump set out to do things differently. Coming out of Georgetown, he decided he would try to translate the good fortune he had inherited into support for children’s cancer research. Why this cause, especially for a guy who still doesn’t have kids? “It’s a great question–it’s one that I’ve been asked before–and I’m not really sure,” he says. “I think there is something about that innocence that has always affected me.” After visiting various hospitals, he chose to give to strength, St. Jude, the world’s best-known pediatric cancer center. Eric Trump set up his foundation as a public charity, a classification that allows it to raise most of its money from outside donors. In 2007, when he was 23, the first Eric Trump golf tournament took place, raising $220,000. A compelling sales pitch evolved–the free golf course and the donated goods and services assured donors that every penny possible went to charity. The Eric Trump Foundation employed no staff until 2015, and its annual expense ratio averaged 13%, about half of what most charities pay in overhead. His original seven-person board was made up of personal friends, an innocuous lot who helped sell tournament tickets, which last year ranged from $3,000 for a single all-day ticket to $100,000 for a pair of VIP foursomes. But in 2011, things took a turn. Costs for Eric Trump’s tournament jumped from $46,000 to $142,000, according to the foundation’s IRS filings. Why would the price of the tournament suddenly triple in one year? “In the early years, they weren’t being billed [for the club]–the bills would just disappear,” says Ian Gillule, who served as membership and marketing director at Trump National Westchester during two stints from 2006 to 2015 and witnessed how Donald Trump reacted to the tournament’s economics. Katrina Kaupp, who served on the board of directors at the Eric Trump Foundation in 2010 and 2011, also remembers Donald Trump insisting the charity start paying its own way, despite Eric’s public claims to the contrary. The Trump Organization declined to answer detailed questions about the payments. But it seems that for the future president, who Forbes estimates is worth $3.5 billion, a freebie to help his son directly fight kids’ cancer took a backseat to revenue. It’s also very consistent. 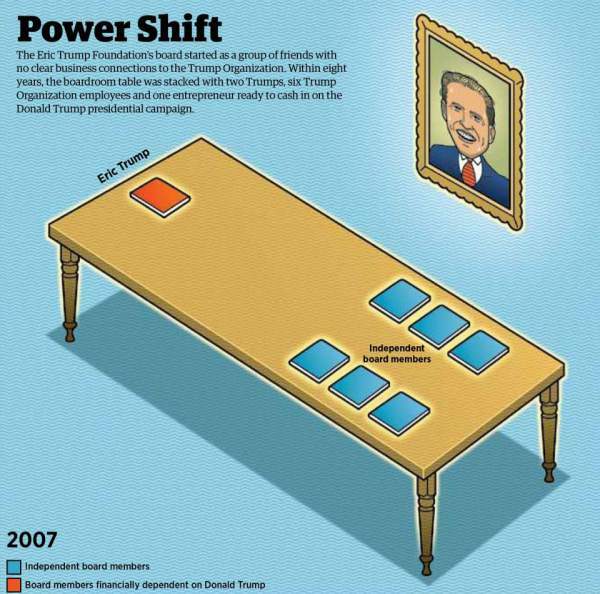 The Donald J. Trump Foundation famously acted like an arm of the overall business, using the charity’s money to settle a Trump business lawsuit, make a political donation and even purchase expensive portraits of its namesake. Meanwhile, Trump businesses billed the Trump campaign, fueled by small outside donors, more than $11 million to use his properties, chefs and private aircraft. It’s hard to find an explanation for this cost spike. Remember, all those base costs were supposedly free, according to EricTrump. The golf course? And the evening performances from musicians like Dee Snider of Twisted Sister and comedians like Gilbert Gottfried: “They did it for free.” So many sponsors donated, in fact, that the event invitation has carried enough logos to make a Nascar team proud. Thus it’s hard to figure out what happened to the money. All the listed costs are direct expenses: Items like overhead and salaries appear elsewhere in its IRS filings. Even if the Eric Trump Foundation had to pay the full rate for literally everything, Forbes couldn’t come up with a plausible path to $322,000 given the parameters of the annual event (a golf outing for about 200 and dinner for perhaps 400 more). Neither could golf tournament experts or the former head golf professional at Trump National Westchester. For his part, Eric Trump offers no indication that the charity is paying for much beyond the day in Westchester. In 2010, the year the economics of the tournament suddenly pivoted, four of the seven original board members, who were personal friends of Eric, left. 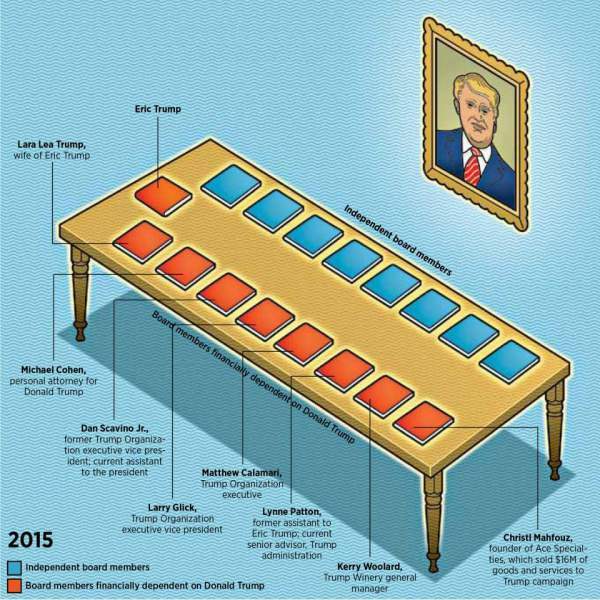 Those 4 were eventually replaced by 14 new board members, the majority of whom owed all or much of their livelihoods to the Trump Organization. Six of them were effectively full-time employees, including Trump lawyer Michael Cohen and executive vice president Dan Scavino Jr., who both serve in political roles for President Trump. Another owns a company that billed the Trump campaign $16 million. Add in Eric himself, as well as his wife, Lara, and 9 of the 17 Eric Trump Foundation board members had a vested interest in the moneymaking side of the Trump empire. The foundation had become a de facto subsidiary of the Trump Organization. In 2013 and 2014, the EricTrump Foundation paid $15,000 for tables at a gala for the Little Baby Face Foundation, according to a spokesman for the latter foundation. Over the next three years, Little Baby Face spent an estimated $100,000 to hold golf outings on the Trump course. The foundation denies any direct connection between the two transactions. Janet McHugh, the founder of a small charity named Julie’s Jungle, was delighted to receive $25,000 in total donations from the Donald and EricTrump foundations in 2013–money she figured came from Eric and Donald Trump personally. Two years later, her charity hosted a golf tournament at Trump National Hudson Valley. McHugh says the decision to hold her tournament there was unrelated to the donation. Other extra expenditures raise eyebrows. In 2013, for example, Eric Trump used his foundation’s money, rather than his own, to pay $1,600 to the American Society for Enology & Viticulture for a copper wine still and an antique bottle washer at a trade event and fundraiser that he was keynoting. Eric runs the family vineyard in Charlottesville, Virginia, about an hour down the road from where the event took place. “I have no idea what that is,” says EricTrump, referring to the payment. Perhaps Eric bought the painting for himself at the auction or on the aftermarket. Perhaps Rodrigue gave or sold him a copy. What does Eric say about the donation? “Let’s follow up later on,” he replies, when asked about it in a phone call, before getting off the line. A spokesperson for the Trump Organization similarly declined to respond further to questions about Eric and Donald Trump. THE ULTIMATE TRAGEDY HERE is that the Eric Trump Foundation has done so much good. 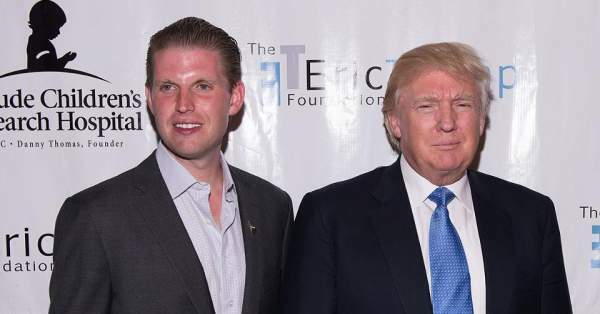 Yes, Eric has indulged in the family trait of vainglory, from EricTrump bobblehead dolls at the tournament to statements that leave the impression he’s giving the money personally, even though tax records suggest he’s donated six figures total, at most. (Trump wouldn’t tell Forbes how much he’s given to his own foundation. “I think it’s totally irrelevant,” he says, citing the fact that “we never charge” for use of the courses.) But in 2015, a new intensive-care unit at St. Jude opened with Eric Trump’s name on it, and the foundation’s money has funded research into a rare form of cancer. But in December, EricTrump said he would stop fundraising. Running an event with an increasing commingling of business and philanthropy created the kind of conflict-of-interest (not to mention image) concerns that similarly plagued Ivanka Trump’s aborted attempt to auction off a coffee date on behalf of Eric’s foundation. Stay tuned to TheReporterTimes for latest Donald Trump news and other worldwide updates.